Recent studies have shown Hydrogen sulfide (H2S) to have a significant signaling role in biomedicine and biology. In particular, H2S, which is produced in the cardiovascular system of mammals, was found to lead to dilation of blood vessels and the lowering of blood pressure. One of the problems in studying this relatively newly discovered gaseous signaling molecule is accurately measuring H2S concentration in biological media. Polarographic and chromatographic methods, which were previously used, not only suffer from significant interferences, but also require labor intensive sample prep procedures which can lead H2S loss from the sample. A recent study by Yang* et al just published in SCIENCE uses a unique method to measure H2S concentration. The paper entitled "H2S as a Physiologic Vasorelaxant: Hypertension in Mice with Deletion of Cystathionine -Lyase" uses a micro H2S electrode developed by LAZAR RESEARCH LABORATORIES, INC., Los Angeles, CA. This unique electrode is the smallest ion electrode of its kind and can measure volumes down to 10 microliters in samples such as 96 well plates. H2S can be measured down to less than 0.1 Micro Molar concentration (less than 100 nano Molar). Sample prep is simple and done directly in the 96 well plate or other micro sample container thereby minimizing H2S loss and increasing accuracy. Unlike other methods, this micro electrode measurement method has no known interferences. System includes micro H2S electrode, ion analyzer with digital output to your PC or laptop, and complete software program for monitoring, recording, and logging H2S concentration data. System includes micro H2S electrode with extra long stem for NMR tubes, ion analyzer with digital output to your PC or laptop, and complete software program for monitoring, recording, and logging H2S concentration data. 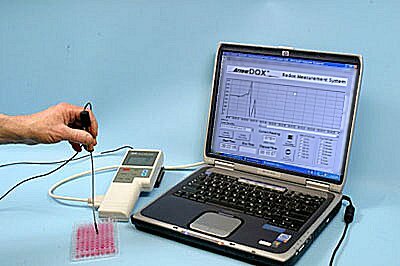 Micro flow through H2S electrode with micro flow cell with input and output ports, ion analyzer with digital output to your PC or laptop, and complete software program for monitoring, recording, and logging H2S concentration data.